TOK Point: Watch the second video - Externalities. Study this simple model of economics and annotate onto it all of the 'Externalities' that are covered in the video. Now read this G20 2014 article and summarise the issue of the model of economics that doesn't include these vital natural processes. Objective: To be able to describe the functioning of the atmospheric system in terms of the energy balance between solar and long wave radiation. Starter: Watch the YouTube video to the right. The main energy that drives all of our weather systems and our climate comes from the sun. The vast majority of this energy is absorbed at the __________ whereas energy is generally lost in the ________ regions. However, this energy is ______________ to higher latitudes by wind and air ________________. Task 1 - Key Words - Copy the key words to the right into your revision booklet for this unit. The earth and its atmosphere constantly receives solar radiation but there are long and short term variations in the earth's climate & recent decades have seen the general rise in global temperatures. This is global warming and will be covered a little later on in the unit. Task 2 - Scroll down to the PDF embedded document beneath. Make a copy of the diagram on the first page and use the text underneath it to make annotated (around the diagram) notes on how the energy budget works and transfers at each stage. Task 3 - Click here to be taken to Cool Geography. Read the information carefully on the page before completing the four activities in full, at the bottom of the page. Make copies of the maps and diagrams where necessary. Task 4 - Complete the 10 mark question using the work sheet beneath. Short-wave radiation is the energy from the sun that enters the earth's atmosphere (very short wavelengths) such as ultraviolet and visible light. Generally emitted by hot bodies. Long-wave Radiation is the energy leaving the earth as infrared radiation at low energy and contains less energy than shortwave radiation. Generally emitted by cold bodies. Greenhouse Effect - Process where water vapour, C02, CH4 & CFCs allow SW energy from the sun to pass through the atmposhere and heat up the earth. However some of the resultant LW radiation is trapped leading to a heating of the earth. 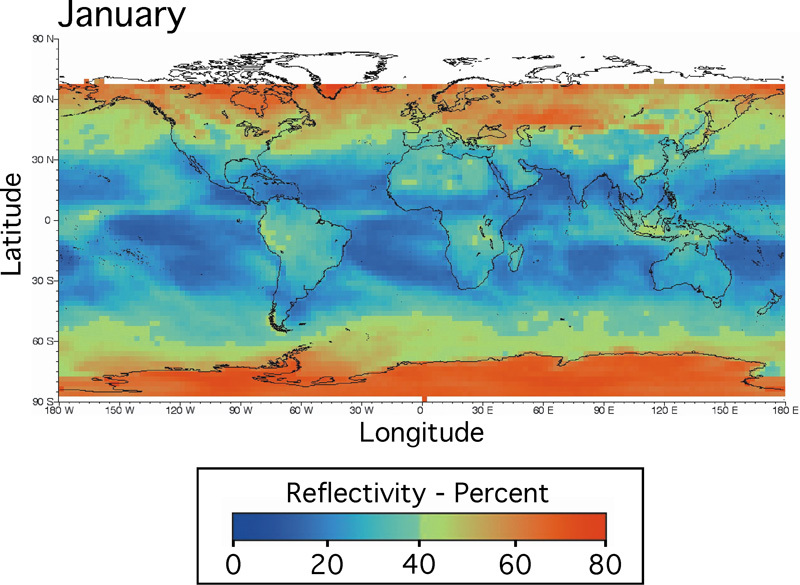 Enhanced Greenhouse Effect occurs as a result of increased quantities of greenhouse gasses in the atmosphere owing to human activities and their impact on these fragile atmospheric systems. Albedo is the fraction of Sun’s radiation reflected from a surface. The term has its origins from the Latin word albus, meaning “white”. It is quantified as the proportion, or percentage of solar radiation of all wavelengths reflected by a body or surface to the amount incident upon it. An ideal white body has an albedo of 100% and an ideal black body, 0%. 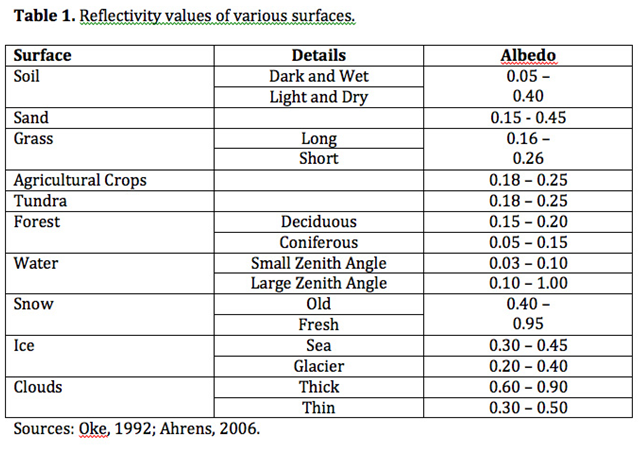 Starter: Make a note of the definition of Albedo above and explain its changes with relation to the surfaces shown in table 1* (below right) using this worksheet. Video Explanation: Polar ice reflects light from the sun. As this ice begins to melt, less sunlight gets reflected into space. It is instead absorbed into the oceans and land, raising the overall temperature, and fueling further melting. This results in a positive feedback loop called ice albedo feedback, which causes the loss of the sea ice to be self-compounding. The more it disappears, the more likely it is to continue to disappear. Task 4 - Conduct some research into sun spots and find out how they are linked to the amount of short wave energy that the earth receives. Click on the graph below right to enlarge and take a copy before answering the questions below. Task 5 - Using the graph (below right), describe the pattern of sunspot activity between 1960 and 2010. Task 7 - Click on this link from the BBC and print out and read the article carefully. i. What is the Maunder Minimum? iii. Outline the impacts of sunspots on continental Europe and its populations.